A soft night in general. ABC: THE GOLDBERGS gained 0.1 to 1.2, but SCHOOLED (0.9), MODERN FAMILY (1.1) and SINGLE PARENTS (0.7) were each down 0.1. 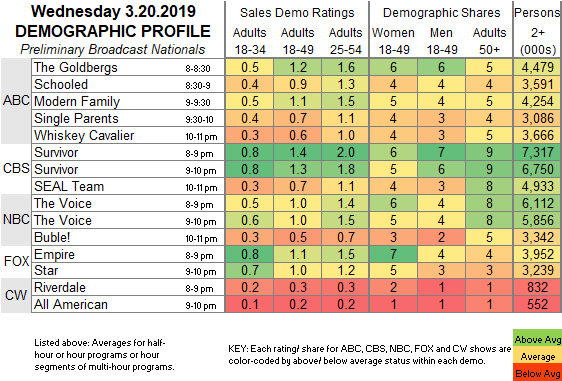 WHISKEY CAVALIER held at 0.6. CBS: A 2-hour SURVIVOR was down 0.1 to 1.4 compared to last week’s hour. SEAL TEAM aired for the first time since January 23 and dropped 0.1 to 0.7. FOX: EMPIRE fell 0.1 to a series low 1.1, but last week it adjusted up by 0.1. STAR was down 0.1 to 1.0. NBC: A 2-hour THE VOICE clip show was at 1.0, and a BUBLE! special was at 0.5. CW: RIVERDALE (0.3) and the season finale of ALL AMERICAN (0.2) were steady. 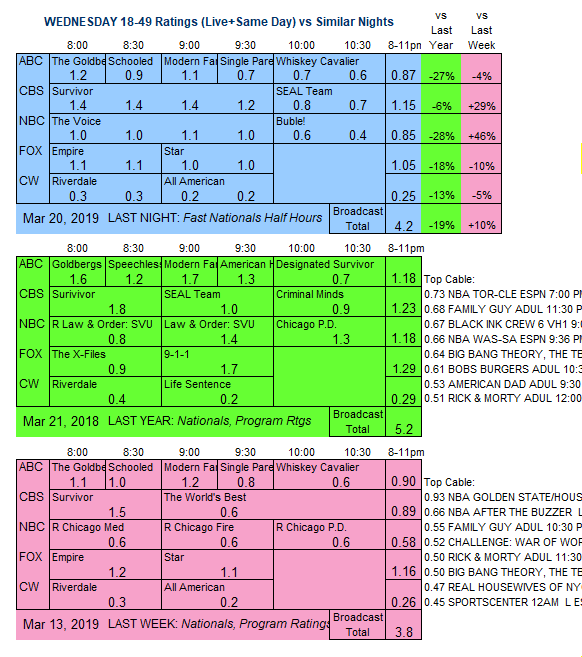 Coverage of the NCAA TOURNAMENT begins in earnest today, as CBS, TNT and TBS join Tru for games running from morning through primetime.